On December 22, 2017, the United Nations Security Council passed another round of brutal sanctions against the Democratic People’s Republic of Korea (DPRK). Although the United States government was the main proponent of Resolution 2397 (2017), it passed with the unanimous vote of all 15 member-states of the Security Council. These genocidal sanctions are the third to be passed in the UN Security Council this year, amounting to a 90% reduction in the amount of oil that North Korea can import as compared to 2016, while also imposing ruthless restrictions on the import and export of food, as well as agricultural, industrial and manufactured goods. Effectively, they amount to an economic and financial blockade of the country. As well, these new regulations introduce targeted sanctions against 15 North Korean officials, and call for the re-patriation of North Koreans working in other countries within the next 24 months, which will cut off a vital source of income for many families. The U.S. government and their imperialist allies claim that these sanctions are the only way to put an end to North Korea’s nuclear program. In reality, whether imposed by the United States or the United National Security Council, sanctions are a weapon of killing people. These ruthless sanctions escalate tensions between the United States and the DPRK. They also further punish the people and government of North Korea for taking a stand as an independent country and refusing to follow the orders of the United States government. The U.S. government will stop at nothing, at no amount of human suffering, to destroy independent governments in order to gain imperialist hegemony over every part of the globe. Iraq is an example of how little human lives matter to the imperialist policy of sanctions and war. Prior to the 2003 invasion, over 1.5 million people in Iraq died as a direct result of 13 years of vicious sanctions by the U.S. and UN Security Council, including more than 500,000 children. Then, the U.S. government and their allies invaded, killing millions more and tearing the country apart at the seams. Other independent countries are also strangled under the mass punishment of sanctions. For nearly 60 years the people of Cuba have been under an cruel and inhuman U.S. blockade that continues to deny Cubans access to life-saving medicines and costs the Cuban economy more than $4.3 billion each year. Although the Cuban government continues to provide nutrition, healthcare, education and housing to all its people, there is still needless suffering imposed by the criminal blockade. On top of threats and sanctions, the U.S. government and South Korea have also continued and even escalated their dangerous and provocative war games just off the shores of North Korea. Just days after a “emergency meeting” of the UN Security Council called by the United States in response to North Korea’s November 29th ballistic missile-test, South Korea and the U.S. launched into military exercises involving over 230 warplanes, and at least 12,000 U.S. troops, and practice air-strikes on North Korea. On top of this, at any given time there are at least 35,000 U.S. troops in South Korea and 40,000 more in neighbouring Japan ready to take military action against North Korea. As well, the U.S. government’s largest naval fleet, the 7th Fleet of the U.S. Navy, is stationed in Japan; with a further 20,000 soldiers, more than 50 warships, and 12 nuclear-powered submarines, as well as the U.S.S. Ronald Reagan aircraft supercarrier. In fact, the U.S. government has imposed a constant policy of aggression against North Korea for over 60 years, coupled with U.S. and UN sanctions. During the Korean War (1950-1953), the U.S. government and their allies, including Canada, were responsible for the deaths of nearly 3 million people on the Korean Peninsula, deployed 32,557 tons of the chemical weapon Napalm, and destroyed 75% of the Pyongyang, the capital city of North Korea. With all of this focus on the nuclear weapons program in the DRPK, it is also important to note that the first nuclear weapons on the Korean Peninsula were not in North Korea. The U.S. government deployed nuclear weapons to South Korea in 1958, where they remained until 1991. The hypocrisy of the US government’s demand that North Korea end all nuclear weapons development goes even deeper – it is the United States that maintains a nuclear arsenal of at least 4,600 nuclear warheads and bombs. On top of this, the United States also remains the only country in the world to have ever deployed nuclear weapons; when they dropped nuclear bombs on the Japanese cities of Hiroshima and Nagasaki in 1945. So, how is it again that the DRPK poses such a grave threat to the world? Then, there is the question of United States support for a nuclear-free zone on the Korean Peninsula. How can the U.S. government claim to be in support of nuclear-free zones when, to protect nuclear armed Israel, they blocked a United Nations conference on establishing a nuclear free zone in the Middle East? As a sovereign and independent country, the DPRK has the right to develop science, technology, and its military capabilities without interference from the U.S. government and their allies. If the UN Security Council were truly concerned with peace and stability on the Korean Peninsula, they would call for the immediate withdrawal of all U.S. troops and military installations from the region, and an end to U.S. military exercises, aggression and sanctions against North Korea. Mobilization Against War and Occupation (MAWO) condemns all U.S. and UN Security Council sanctions against the Democratic People’s Republic of Korea as a genocidal act of war against an independent and sovereign country. It is the threats, inhuman sanctions and military actions, of the U.S. government and their allies against the DRPK that are the biggest threat to peace and stability in the region. It is clear that this meeting will not put any discussion of U.S.-led aggression, threats, and sanctions against North Korea on the table. Rather, this meeting has been called to further attempt to isolate and demonize the DPRK, to bolster U.S. and imperialist interests in the region. 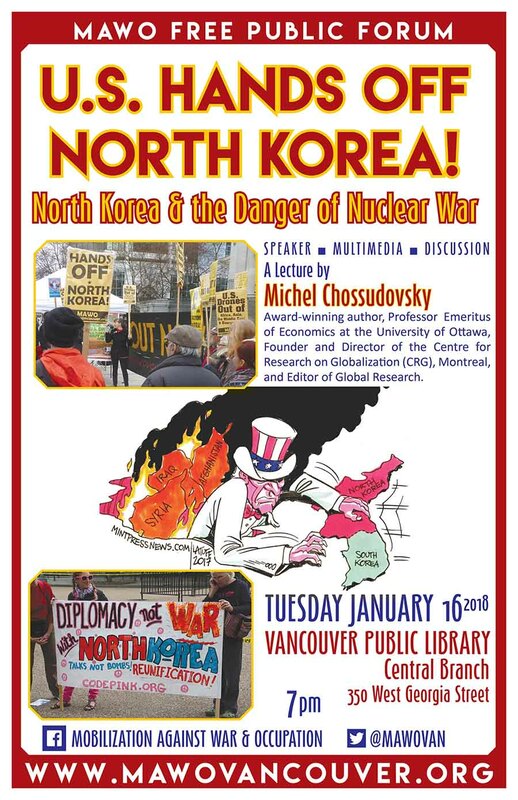 As peace-loving people in Vancouver we must unite against these war-mongers and call for an end to the inhuman sanctions imposed on 25 million people in North Korea! Mobilization Against War and Occupation calls on all people who stand with the right of the Democratic People’s Republic of North Korea to self-determination and an end to imperialist threat, sanctions and military actions against the DPRK to unite. On January 16, 2018 we must join together to let the so-called “Vancouver Group” know that they are not welcome here! 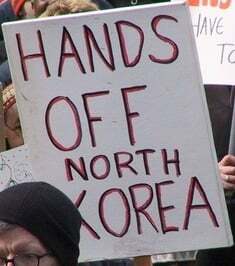 No to Sanctions and Threats on North Korea! End Imperialist Aggression Against North Korea! US/Canada Hands Off North Korea!